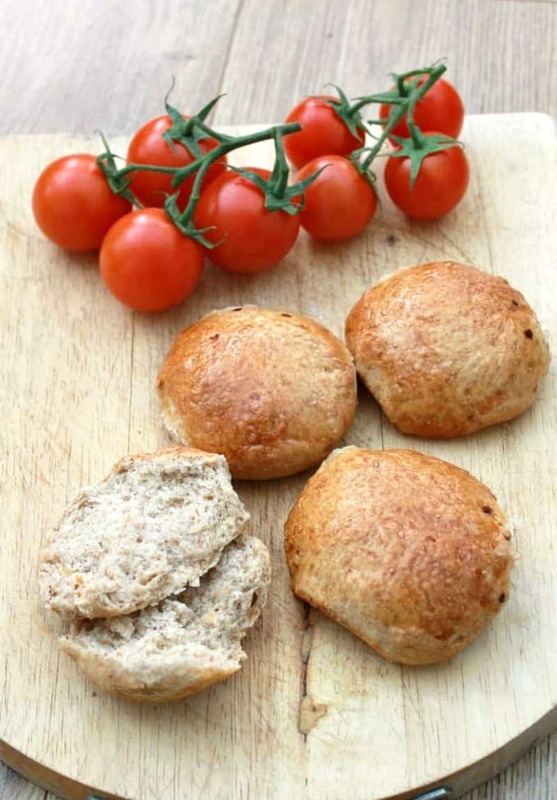 Wholemeal bread rolls, given a nice kick with crushed chillis! Delicious for dipping into soups and stews or spread with houmous. 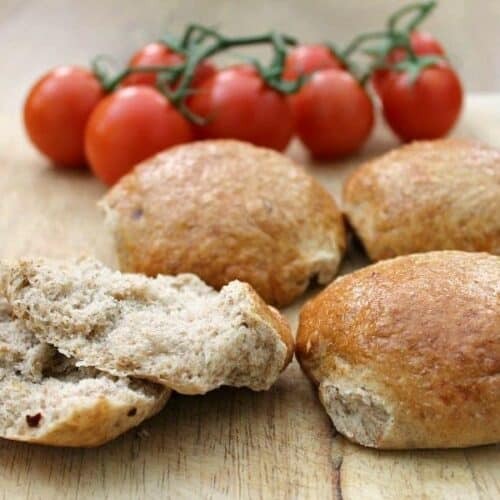 These wholemeal chilli bread rolls are great for making a small batch at the weekend so you have fresh bread for the week ahead (freeze to make them last longer). I’m delighted to now be co-hosting Bready Steady Go along with Michelle from Utterly Scrummy Food for Families. Jen from Jen’s Food was the previous co-host you may remember. Bready Steady Go is a monthly blogging challenge for bread and yeasted bakes, so you can expect to see a lot more bread and yeast-based recipes here on the blog! 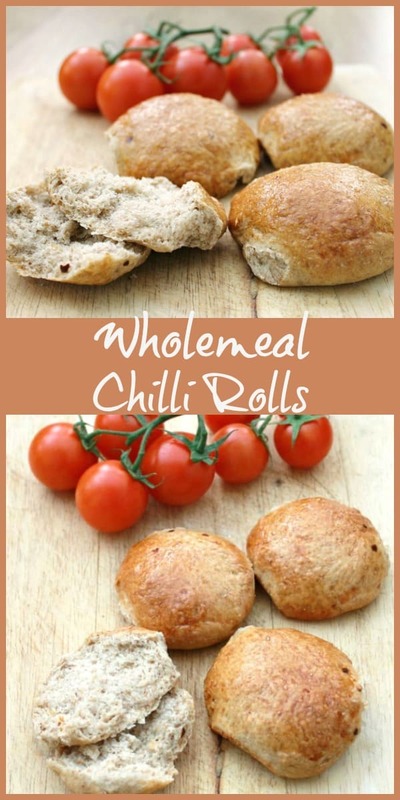 These wholemeal chilli rolls taste great as a base for your sandwich creations or alongside a pot of chilli or casserole. I’m sure I’ll still be making them when it warms up to serve with houmous, tomatoes and salad. This recipe makes six rolls so is ideal for a small family or if you don’t want to make too many rolls all at once. Place the flours in a large bowl (or the bowl of a stand mixeand add the salt on one side of the bowl and the yeast on the other. Add the butter and then add half the egg. Keep the rest for egg wash before baking. Add the milk and water and mix until the dough forms a ball. You may not need all of the water so add it bit by bit. Knead the dough for ten minutes until it is smooth and elastic (either by hand or using a stand mixer for about 8 minutes). Place the dough in a bowl covered in clingfilm to prove for an hour until doubled in size. When the dough has risen, take it out of the bowl, add the crushed chilli and knead lightly to mix it through. Form it into a ball and then tear into 6 pieces. Form each piece into a ball and place on a lightly oiled baking sheet or tray to rise again, for about an hour, until it has doubled again. Brush the rolls with the leftover egg. Bake for 15 to 20 minutes until golden brown. Tap the bottom of the rolls to check if they are baked through. It should sound hollow if they are done. 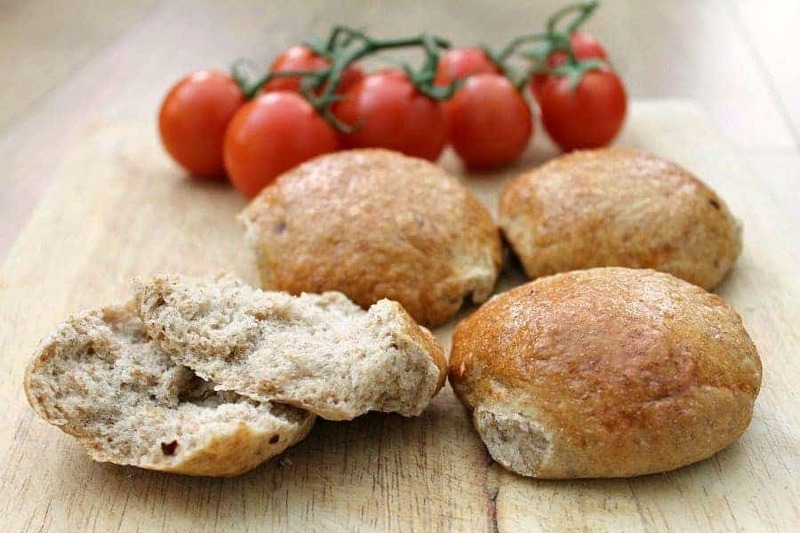 Do you enjoy making your own bread too? If you blog bread recipes do make sure you link up with Bready Steady Go! 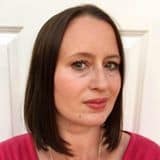 With a full monthly roundup and Pinterest board it is a great way to get your posts out there. Thanks Jen! 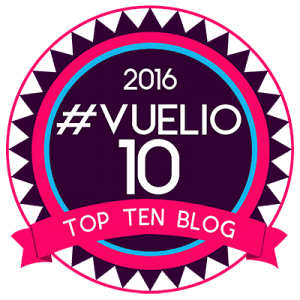 Great to see you have a new recipe on the blog today, I am coming over to visit! 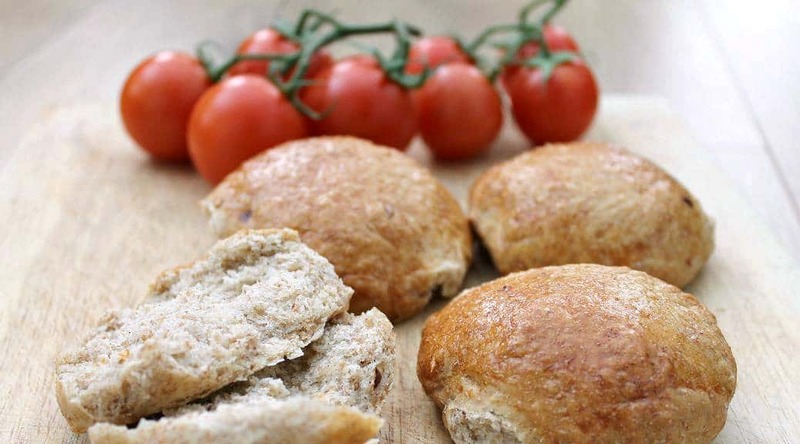 Yum, what perfect rolls Lucy – and a kick of chilli is always welcome in a homebaked roll! Delicious. thanks Kate, they are great with a bit of cheese and houmous! These look perfect with soup or maybe a stew, or the goulash I posted recently?